John Barrowman, who stars in the Doctor Who spinoff series Torchwood, told SCI FI Wire that he’s open to playing omnisexual time traveler Capt. Jack Harkness for years to come. Lost returns on Thursday nights. USA Today has some information on the upcoming season. Last week the trailer to the upcoming Star Trek movie was shown with the opening of Cloverfield and low quality copies quickly popped up on line. A high definition version is now available here. Also click on the red dot for further views. This photo has Gisele Bundchen portraying Wendy Darling, with Mikhail Baryshnikov as Peter Pan and Tina Fey as Tinker Bell. A close up of Tina Fey is available here. The Clintons want to play dirty, to quote George Costanza “Well, there’s nothing dirtier than a giant ball of oil.” George Costanza may have been a fictional character from Seinfeld, but he was the sort of guy that would poison his boss, run down Lloyd Braun for being in a mental hospital, encourage Jerry to have a revenge date, and to torment an employer by dropping a giant ball of oil all because this employer discovered he had faked a disability. A friend like this could do the same thing to Hillary that Bill is doing to Obama. The thing is a Costanza type might take each of Bill Clinton’s smart barbs and media explosions as a challenge to drive the Clinton campaign to a fake house in the Hamptons with two solariums and horses named Snoopy and Prickly Pete. In short, Obama needs an attack dog that would relish a fight and not know when to quit. Several suggestions for attacking Hillary are provided in the post. It is unseemly for a former president to be sniping at reporters and railing against caucus rules and Primary dates. It is heartbreaking to watch him degrade and attack Barack Obama … deliberately obscuring the facts and going for the cheapest of shots. During an election season this is referred to as ‘throwing elbows”. Any other time this would be called ‘lying’ and ‘race-baiting”. My friends on the ground in the primary states report to me that the behavior of the Clinton campaign is appalling. Many of them are former supporters and it is truly upsetting for them to witness the “anything to win” tactics of the Clinton folks. I knew from the beginning, when Terry McAluffe arrived in LA and threatened “You are either with us or against us”, that there was cause for concern. Now there is cause for alarm. This is not good for the Country and in the end it is not good for Hillary Clinton. They are at risk of fracturing the party that they hope to lead. There are some wounds that will never heal. There is a war going on for the soul of the Democratic Party and there are arguments to be made on both sides. The Clintons have been sowing the seeds of a Hillary presidency for years. They are surely and rightfully anxious about the ascendance of the young man from Illinois. The Clintons have dominated the party for decades and not always for the good. The Bushes have embarrassed and exhausted many of the staunchest supporters of the right. That is why we must look at this election in the wider context of the state of the union. For the first time since 9/11 we have an opportunity to bring this country together. To do this Americans may well be wise to choose the new guard over the old. Hillary Clinton might have pulled her attack ad on Obama in South Carolina less than twenty-four hours after receiving criticism for its dishonesty, but this doesn’t mean she hasn’t discontinued her dirty tricks. Clinton is trying to circumvent party rules and have the Michigan and Florida delegates seated. Clinton won the Michigan caucus due to being the only major candidate to leave her name on the ballot after all the candidates agreed not to campaign in the state. Many bloggers feel she has now gone too far. This is the sort of decision that has the potential to tear the party apart. In an attempt to retain some control over the process and keep the various states from accelerating their primaries into last Summer, the Democratic National Committee warned Michigan and Florida that if they insisted on advancing their primary debates, their delegates wouldn’t be seated and the campaigns would be asked not to participate in their primaries. This was agreed to by all parties (save, of course, the states themselves). With no one campaigning, Clinton, of course, won Michigan — she was the only Democrat to be on the ballot, as I understand it, which is testament to the other campaign’s beliefs that the contest wouldn’t count — and will likely win Florida. And because the race for delegates is likely to be close, she wants those wins to matter. So she’s fighting the DNC’s decision, and asking her delegates — those she’s already won, and those she will win — to overturn it at the convention. She’s doing so right before Florida, to intensify her good press in the state, where Obama is also on the ballot. And since this is a complicated, internal-party matter that sounds weird to those not versed in it (of course Michigan and Florida should count! ), she’s adding a public challenge that, if the other Democrats deny, will make them seem anti-Michigan and Florida. But if this pushes her over the edge, the Obama camp, and their supporters, really will feel that she stole her victory. They didn’t contest those states because they weren’t going to count, not because they were so committed to the DNC’s procedural arguments that they were willing to sacrifice dozens of delegates to support it. It’s as hard as hardball gets, and the end could be unimaginably acrimonious. Imagine if African-American voters feel the rules were changed to prevent Obama’s victory, if young voters feel the delegate counts were shifted to block their candidate. It’s dirty business on the part of the Clinton campaign, no question. And cloaking the nasty little power grab with the language of democratic inclusion irritates me even more. I can’t say that I’m completely surprised, but I would have preferred if Hillary had demonstrated more appreciation for party unity than this; it amounts to an effort to steal delegates. No one is more disappointed that Florida Democrats will have no role in selecting delegates for the nomination of the party’s standard bearer than Senator Obama. When Senator Clinton was campaigning in Iowa and New Hampshire, she made it clear that states like Michigan and Florida that wouldn’t produce any delegates, ‘don’t count for anything.’ Now that Senator Clinton’s worried about losing the first Southern primary, she’s using Florida for her own political gain by trying to assign meaning to a contest that awards zero delegates and where no campaigning has occurred. Senator Clinton’s own campaign has repeatedly said that this is a ‘contest for delegates’, and Florida is a contest that offers zero. Whether it is Barack Obama’s record, her position on Social Security, or even the meaning of the Florida Primary, it seems like Hillary Clinton will do or say anything to win an election. When he is the nominee, Barack Obama will campaign vigorously in Florida and Michigan to put them in the Democratic column in 2008. Robert Novak is spreading a rumor that there might be a deal between Obama and Edwards in which Edwards becomes Attorney General. I hope this isn’t true as after the mess created in the Bush years we need someone with a stronger background in Constitutional law and civil liberties. Q: I’d like to introduce Sen. John Kerry, former Democratic presidential candidate in 2004, United States senator now. Welcome, Sen. Kerry. Kerry: Good morning, glad to be with you. Thank you. Q: So, senator, you have endorsed Barack Obama, and this week, of course, the campaign was absolutely consumed with these charges and counter-charges, and it seemed to many of us that Obama’s message about hope and change was pretty much drowned out. What happened, here? Kerry: Well, I think you had an abuse of the truth, is what happened. I mean, being an ex-president does not give you license to abuse the truth, and I think that over the last days it’s been over the top. Things have been said about Barack Obama‘s positions that are just plain untrue. It was said in Nevada, it’s been said about Social Security, it’s been said about Yucca Mountain, and it’s been said in South Carolina. I think it’s very unfortunate, but I think the voters can see through that. When somebody’s coming on strong and they are growing, people get a little frantic, and I think people have seen this sort of franticness in the air, if you will.My sense is, Barack Obama offers a better opportunity to pull America together than any other candidate in the race. If you look at the fact that the governor of Arizona, a red state, Gov. Janet Napolitano, has endorsed Barack Obama, former governor and now senator, Ben Nelson of Nebraska, red state, has endorsed Barack Obama. The two senators from North Dakota and South Dakota, the Democratic senators, have endorsed Barack Obama. Claire McCaskill, the senator from Missouri, Gov. Tim Kaine of Virginia, was asked the question, “Can a Democrat carry Virginia?” And his answer was, “the right Democrat,” and then he endorsed Barack Obama. So, I think Barack Obama has the ability to pull the nation together, to offer the kind of inspired leadership that we need to tackle some very serious problems, and to make America stronger in the world. And that’s why I’m for him. Q: Let’s just go back to what you said right at the beginning. So you are saying, then, that former President [Bill] Clinton is the one who has been abusing the truth? Kerry: I think there has been an overreach with respect to what Barack Obama has said and when he said it, and I think it’s been unfortunate, but I don’t think we ought to spend our time there. I think people want to focus on what are you doing to do to get my health care, what are you going to do to get my job?I think that Barack Obama, for instance, has a stimulus plan that is important to the workers of South Carolina and to the rest of the country. Because, first of all, it’s smart. It’s not going to be a long-term budget increase, it’s going to be a temporary one; it’s targeted to the middle class; it’s targeted to poor families who need the relief. But it also provides money to business investment — business incentive in order to help create the jobs we need to move the Economy and he focuses also on the sub-prime housing crisis, which I personally believe is one of the single most important components of restoring confidence in the Economy. Q: Of course, Hillary Clinton is running a very focused campaign on the economy and now certainly her own stimulus plan was criticized by some but she has former President Clinton’s Economic record to run on, how does he push back against that, that’s a very powerful asset that she has. Kerry: Sure it is, but people again need to be able to distinguish. Look, I supported the programs, a lot of things that we did in the 1990s, but I think everyone understands we had a technology boom in the 1990s which was unprecedented, and everybody benefited from that. We made some tough decisions and we ought to be proud of them, about the budget and the deficit. But the fact is, that was not Hillary Clinton making those decisions. It was a different team, at a different time.In fact, Barack Obama has more legislative experience than either of his two opponents. He served eight years in the Illinois legislature and now several in the United States Senate, in total, he has more legislative years. And if you look back in history, Abraham Lincoln had only two years in the United States Congress, and then he lost. He was sent back to Illinois in shame, ran for the United States Senate, lost his race for the Senate, then was nominated to be the leader of his party. And he became, arguably, our greatest president in history. So I think you have to look at the breadth of experience, and the type of experience. You know, I look at Barack Obama: He’s older than Bill Clinton was Bill Clinton became president. He’s older than John Kennedy was, he’s older than Teddy Roosevelt was and he has a broad experience and has proven his ability through his campaign to be able to lead and to pull people together. And again, I go back to what I just said — look at the coalition he is building: Nebraska, Arizona, Virginia, Missouri, North and South Dakota. These are the states where we need to build that kind of new coalition, and I think he’s attracting independents and Republicans and Democrats who are fed up with the way things have been. We gotta change. Q: Just a couple quick questions, because you made such interesting points here, senator. The consensus seems to be now though that, for whatever reason, Barack Obama is now identified as the “black candidate.” How did that happen? Kerry: Well, if it happened, I’m not sure that that is accurate at all, and I don’t necessarily accept it. But to whatever degree that has been injected here, it has been injected, frankly, by the other campaign, and I think it’s unfortunate, but I just don’t accept that. And I think the people that are supporting him is evidence of that.I don’t look at Barack Obama and see a black candidate. I see an inspiring, young, American United States senator — that’s what I see — who happens also to be African American. Just as Hillary happens also to be a woman, and just as John Edwards happens also to be a white. So what? What you look at– I mean, this is the test of this race. Are we the country we say we are? Are we the country that holds certain truths to be self-evident, words which incidentally were written by a 33-year-old named Thomas Jefferson. You know, are we the country that judges people by the content of their character, not the color of their skin — words that were written by Martin Luther King when he was about 34 years old. So the fact is that, to whatever degree that issue has been put in this race, I think this is a moment for Americans to prove it doesn’t matter anymore, and we’re beyond that. And that’s one of the transformative aspects of this candidacy that I find so appealing and so important to the nation and to the world. If we can elect Barack Obama, the message to the world about who we are, what we believe and what the possibilities are in America, are extraordinary. Q: Well, very strong case made, certainly, on behalf of your candidate. Thank you so much, Sen. John Kerry. I hope you can join us again. Kerry: It’s a pleasure to be with you. Thank you very much. …the story has been around for a while, but there doesn’t seem to be anything to it. The LA Times went digging, and ran a front-page piece on the “controversy” on Wednesday, but if there’s anything seriously damaging about Obama and Rezko, the LAT couldn’t find it. The essence of the matter is that there doesn’t seem to have been any quid to go with the pro quo here. 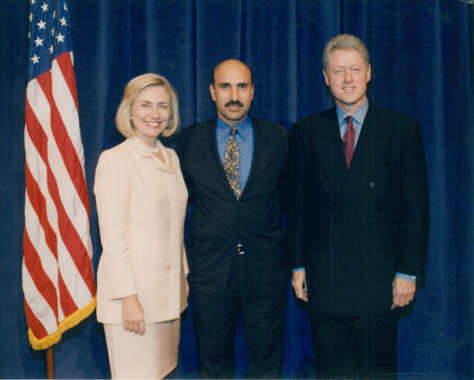 Rezko tried to curry favor with politicians in order to get stuff from them, and Obama was no exception…what makes this sort of line of attack curious to me is that if there’s one thing we absolutely know for sure about the Clintons it’s that if you’re inclined to make mountains out of molehills there are tons and tons of thin ethical charges you can make against them. For what it’s worth, I don’t think the Rezko thing is a very big deal for either candidate. So far as I can tell, Obama didn’t do any favors for him–other than giving the son of a Rezko friend an internship. And, just because Drudge has a photo of the Clintons with Rezko doesn’t mean they did anything untoward, either. But, of course, Hillary was the one who brought up Rezko (in response, to be fair, to Obama’s shot about her serving on Wal-Mart’s board), so she left herself open to this sort of thing. I wonder if the Clinton team is furiously searching for a photo of Obama with Sam Walton.